The residents of Port Arthur, Texas have lived with the reality of hurricanes since the town was settled in the mid-1800s. Today, Southeast Texas is witnessing an increase in the intensification and frequency of major storms that cause widespread flooding. This has prevented the community from making any significant headway towards a full recovery before another storm causes damage and renewed recovery efforts. Hurricane Rita in 2005, Humberto in 2007, and Ike in 2008, all severely impacted the city and its residents. When Hurricane Harvey made landfall on August 30th, 2017, it left a devastated town in its wake. Once a bustling commercial center, the port city hit its economic peak in the early 1900s. In the years following 1960, the city experienced a population downturn as businesses left the area. A crippling economic recession followed. Recently, new investments have been made in the city’s oil refineries, including the expansion of the Saudi Aramco-Motiva refinery—the largest petroleum refinery in the United States. Operations are supported by the Port of Port Arthur which remains one of Texas’ leading seaports. Despite these changes, the city continues to suffer with one of the highest unemployment rates in the state and struggles with high crime rates. An environmental justice community, the EPA identifies Port Arthur as having one of the highest levels of toxic air releases in the country with companies landing numerous state air quality violations over the years. Asthma and cancer rates are highest among residents living on the west side of the city where many people live in federal housing projects. Hurricane Harvey left many of Port Arthur’s elderly African American community without adequate resources. Many are stranded in mobile homes and have been unable to re-enter their homes damaged by the flooding. The legacy of Jim Crow is still felt in Port Arthur as many poor African Americans were historically forced to live in the most flood prone areas of the city. Flooding has damaged the structure of many of the homes, causing dangerous mold outbreaks. An estimated 20-30% of homes have not been assessed post-Harvey in Jefferson County which affected 75% of residents. Community In-Power and Development Association Inc. (CIDA Inc.) is a non-profit organization that works with underserved communities throughout Port Arthur to combat environmental injustices related to air pollution and environmental contamination. Under the leadership of CIDA’s founder, Hilton Kelley, the group has fostered cooperation between Port Arthur communities and industry resulting in a reduction in emissions and better lives for those who live next to petrochemical facilities. 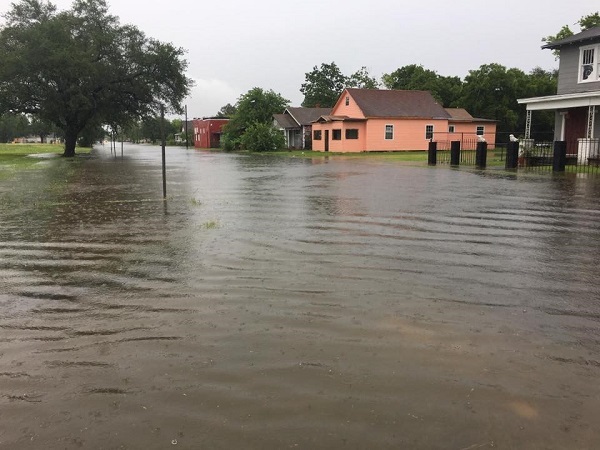 CIDA Inc. would like to obtain a better understanding of flooding and hydrology throughout Port Arthur in order to devise a plan on how to best revitalize and prepare the community before the next storm. The organization would like to work with a dedicated hydrologist to investigate the urban flooding, synthesize available reports and develop next steps or proposed solutions. An important part of this project will be the design of an educational campaign aimed at community members and local decisionmakers. This project has been conceived and designed in partnership with community leaders at CIPA Inc. and with our national partner, Flood Forum USA. Hilton Kelley is the Founding Director of Community In-Power and Development Association Inc. (CIDA Inc.), a non-profit that works to empower low income residents to take action on environmental issues. Mr. Kelley is the 2011 winner of the Goldman Environmental Prize for his work on environmental justice issues along the Texas Gulf Coast. Dr. Luis Angel Gomez Cunya is a member of the Hydroinformatics Research Group at Oregon State University. His research interests include urban flooding and climate change adaptation.